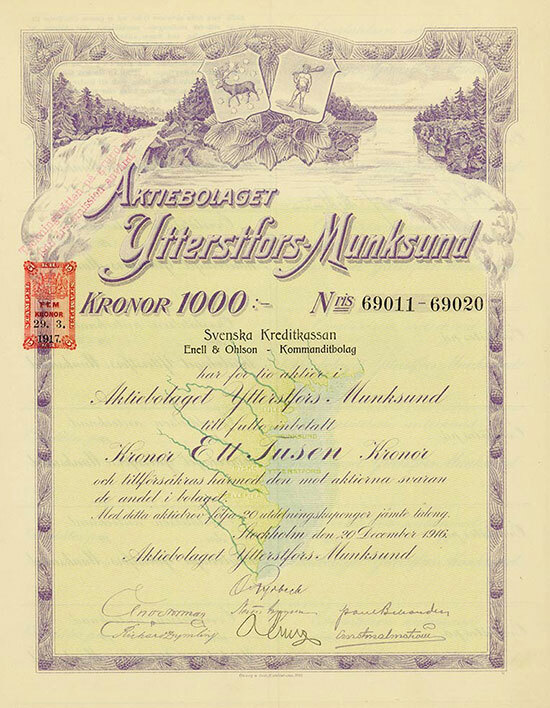 Stockholm, 20.12.1916, 10 Aktien zu 100 Kronen, #69011-20, 29,4 x 22,8 cm, blau, oliv-grün, türkis, Steuermarke, dekorativ. Stockholm, 20 December 1916, 10 Shares of 100 Crowns, #69011-20, 29.4 x 22.8 cm, blue, olive-green, turquoise, revenue stamp, superb. Das Forstwirtschaftsunternehmen betrieb Sägewerke, Verkoksungsanlagen und eine Bahn. The forestry company operated a sawmill, cocking and a railway.